The on-screen keyboard on the iPad works well, but if you need to do a lot of typing a regular keyboard may make life easier. Keep in mind that any Bluetooth keyboard will work with an iPad, you don’t have to use the one from Apple (which is a bit over priced, wait did I just say that out loud). You can find Bluetooth keyboards at Amazon, Best Buy, and many other places usually starting around $20. 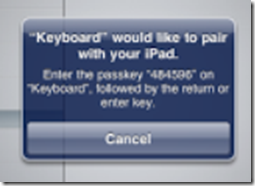 The following steps will explain how to pair (that’s what connecting Bluetooth is called) your keyboard with an iPad. Tap on Bluetooth, if its Off, tap on it to turn it On. 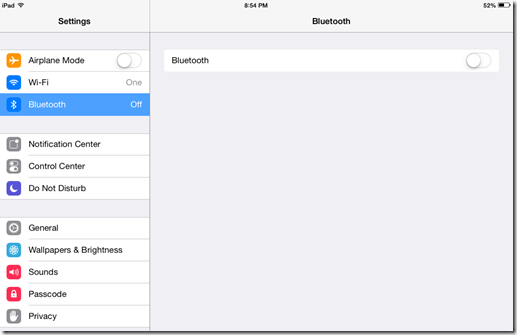 Once you do this, your keyboard will show up under Devices and say Not Paired. Tap on it, You will be prompted with a message to type a series of numbers on the Bluetooth keyboard and then press Enter on the keyboard. The keyboard should up under Devices and say Connected.